Welcome to Prestige Chrysler Jeep Dodge LLC Finance Department, your auto loan and car lease resource for Sunrise Manor, NV; Henderson, NV; and Winchester, NV. We’re eager to provide financing for your new car, or we can assist in used car financing. Check out our online car loan calculator for an instant car loan rate. Then, proceed to our online finance application. All types of credit, from good to bad, can qualify for an auto loan. No credit, no problem! We will work with you to secure a no credit car loan if your situation demands it. Prestige Chrysler Jeep Dodge LLC has strong relationships and is committed to finding you the perfect car loan company to suit your car finance needs. Our new and used Las Vegas car dealership offers a variety of auto financing options for new Jeep, Dodge, Ram and Chrysler cars and used cars in the Las Vegas region. Whether you are looking for a low interest car loan in greater Las Vegas or a great lease deal, Prestige Chrysler Jeep Dodge LLC provides an online auto finance application that makes it easy to finance your next new or used car. We can help Nevada residents with less than perfect credit get an auto loan too. If you would like to have us get in touch with you to answer any financing questions, just fill out our contact form. 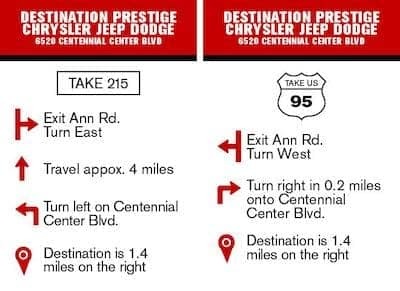 Visit our Jeep, Dodge, Ram and Chrysler dealership at 6520 Centennial Center Blvd in Las Vegas, NV, or call us at (702) 625-7812 to speak to an auto loan professional!